When the euphoria of victory dies down, and together with it the media hype ceases, when the guns do not rattle and boom anymore and the sky, the land and the sea become calm and serene, when tranquillity reigns through it is natural to live in the present moment and forget the past. But one cannot live in the present without a past. Nor can one envision the future discarding the experience of the preceding events. Hence the Daily News is serialising the Chronicle of LTTE Terror taken from our own archives which would remind our readers how it all began. An awareness of the chronology of terror would help us prevent the recurrence of such terror and frustrate any attempts by misguided elements to repeat history to suit their evil designs. It was not simple terror. Nor was terror sporadic. It was all pre-planned, pre-determined, well-calculated terror. The victims were innocent people. Though it is too many innumerate we would like to recall the major episodes in the Chronology of Terror. Over a hundred bus passengers believed to belong to all communities were killed yesterday in the worst terrorist massacre in recent months when three buses travelling along the Habarana - Trincomalee Road were stopped near Kitulotuwa between the 123rd and 129th milepost and the passengers shot dead in cold blood. A military spokesman said last night that 107 persons including women and children were dead and over 60 injured. “They stopped the buses, lined-up the passengers and mowed them down. It was a terrible business”, the spokesman said. He said that two of the buses were coming from Trincomalee and one going there. There was no clear information on whether the vehicles belonged to the CTB or were private coaches or both. But a later police report said that all three vehicles were private buses, some carrying passengers from Colombo to Trincomalee. Another report said that a fourth vehicle - a private car - had also been stopped and the people in it killed. This was confirmed by a police report. The spokesman said that the casualties had been moved to Habarana and some to Anuradhapura. At least two helicopters were deployed for this work and the. Air Force Avro too was pressed into service. “Everything that can be done is being done. It’s being raining and this hampered the rescue effort”, the spokesman said. The first report received by the authorities in Colombo said that between 50 to 60 persons had been killed, the majority of them being Sinhalese. The attack came on the seventh day of the unilateral ceasefire announced by the Government. A number of the victims were believed to be people travelling at the end of the New Year holiday. The government yesterday extended the curfew in the Trincomalee district as terrorists struck again, killing at least 15 civilians - five men, five women, four young girls and a boy - in an Eastern village on Sunday night. An official spokesman said that the LTTE gang which gunned down 126 passengers at Kituluttuwa on Good Friday, was believed responsible for the pre-dawn raid on the Jayanthipura village, North of Kantalai. The curfew reintroduced at 6 p.m. on Sunday will continue until 6.00 a.m. today, the Government said. In a special Government communique, the centre said: “The savage brutality and murderous nature of these attacks show that the LTTE terrorists are now cornered and have resorted to mass murder in a last ditch attempt. “It is also an attempt to drive away traditional Sinhala peasants from Trincomalee, Polonnaruwa and Amparai districts. “The possibility of innocent Sinhala and Tamil villagers being subject to attack in the days to come was pronounced by National Security Minister Lalith Athulathmudali, at a press conference on April 11. Commenting on the two massacres, the Centre said the fact that Sinhalese passengers, including two-month-old babies, were separated from the others and mowed down by gunfire, brands this as a typical LTTE killing. 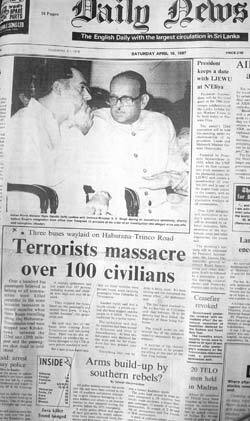 These mass murders were comparable to the massacre of 150 Sinhala devotees at Anuradhapura in May 1985. “Of course the genocide of Tamil youth by the LTTE also needs to be mentioned here,” the Centre said. Meanwhile, terrorists also launched a mortar and RPG attack on Oddusudan Police station, in the Mullaitivu district, on Sunday night, killing a police officer. Troops retaliated with mortars and RPGs, the Centre said. A powerful bomb exploded in the heart of Pettah at 5 p.m. yesterday killing at least 100 persons and injuring a like number. Police believe the explosion took place in the Central Bus Station (CBS) area. The explosion occurred when the area was crowded with office workers returning to their homes. The worst hit were the private coaches parked opposite the CBS building, some of which were reduced to charred metal hulks. A Mitsubishi Lancer car parked opposite the CBS building was seen burning. Eye witnesses said the area was teeming with office workers and the buses were packed to capacity at the time of the blast. The CBS building housing a bank, several cafes and shops suffered extensive damage. Fire engines which rushed to the scene were attempting to put out the resulting blaze at the time of going to press. Police said the casualty toll among pavement hawkers outside the CBS building was heavy. Public co-operation was extended to the police and security forces who had to transport the injured to hospital. Several private coaches parked in the vicinity also rushed to the scene and took the injured to hospital. Ambulances from the Fire Brigade, Red Cross, General Hospital, police and the armed forces also rushed to the scene and transported the injured and the dead with the assistance of the public. The central bus station which was cleared within minutes of the explosion was strewn with glass from shattered at the time, windows on the upper floors. Eventhough most offices were closed, eye witnesses said there were people inside the bank building. However, there was no indication as to the number who would have been inside the building at the time of the blast. 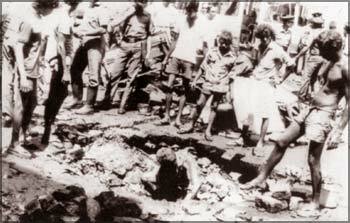 Official sources said that the bomb appeared to be the work of EROS which works closely with the LTTE. EROS was considered responsible for the rash of bombings in and near Colombo last May, beginning with the blasting of the AirLanka Tristar. It was a Good Friday, April 17,1987. A week before that the government had declared unilateral ceasefire as a measure to bring the murderous separatist terrorist groups to the negotiation table to discuss an India backed settlement to the so-called ethnic problem. On this day when the Christian citizens of the country were at prayer and retreat two buses were travelling from Tricomalee to the South and one bus was going in the opposite direction. Between the 123 and 129 mileposts on the Trinco-Habarana Road there is a deserted place usually without any human beings seen on the road called Kitulotuwa. When the buses from Trincomalee arrived at this place they saw some armed persons wearing a large number in uniforms, some standing on the road. The buses stopped and the passengers were ordered out and lined up first. They were next relieved of their cash and any gold jewellery and were mowed down by the group of terrorists. Nearly 90 civilians, women and children among them were all killed. 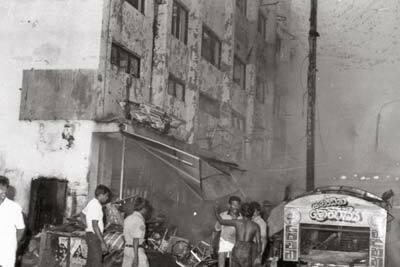 Those who hid in fear in the buses were also killed by the terrorists – LTTE – after relieving them of their cash and valuables. The next bus coming from the opposite direction too was stopped and a similar fate awaited the passengers including women and children and when the gory carnage of killing innocent civilians – women and children not spared – was over 130 people had died and another 60 were injured. Among the dead were also 30 servicemen in civvies who were coming home on leave. Among those who survived were two young men who had saved themselves by mere chance. One was Nimal Jayasinghe, a 24 year old youth who had also hidden with some other passengers in a bus. Fortunately he was in the rear of the bus and when the terrorists spraying bullets on the passengers came into the bus some who got shot fell on him while he was ducking. He said he pretended to be dead and held on to a four year old girl who too had not been injured. He whispered in the girl’s ear telling her not to move and the two escaped. Yet another young man Sarath Ranasinghe too followed the act put on by Jayasinghe and crept under a seat where a number of dead bodies had fallen and also escaped death. The Kitulothuwa massacre of civilians including women and children came to be known as the Good Friday Massacre but it proved something that most media persons of the day had not noticed. For the LTTE leader Prabhakaran who was born a Hindu and was later converted a Christian had not cared a straw for Good Friday that was one of the holiest day of the Christians. Therefore all those optimists including the godfathers of the separatist terrorists could only be called those living in a fool’s paradise if they thought the bloodthirsty terrorists could be made to reason then or later.